Liverpool marked the start of National Hate Crime Awareness week with a special event organised by Merseyside Police. 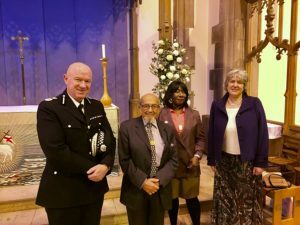 Held in the Church of Our Lady and St Nicholas, the event was chaired by BBC Radio Merseyside presenter Roger Phillips and featured talks from Dr Gee Walker, the mother of Anthony Walker – who was killed in a racially motivated attack in 2005 – and Holocaust survivor, Harry Bibing. It also featured moving performances from members of Daisy Inclusive UK, a charity which helps disabled people and their families. They were joined by members of Merseyside Volunteer Police Cadets, Police and Crime Commissioner and Chief Constable, Jane Kennedy, and Andy Cooke, along with representatives from the Michael Causer Foundation as well as Liverpool and Everton football clubs. People from all over Merseyside joined in celebrating the region’s diversity, with this being the fifth year it has been held. Chief Constable Cooke told JMU Journalism: “The main goal of today is heightened awareness, ensuring that people realise this is important topic not just for the police, not just for local authorities, but for the whole community. The event follows in the wake of the EU referendum, which sparked a rise in hate crimes in the UK, with National Hate Crime Awareness Week aiming to promote a message of equality.